Keep the date in your diary, a fun event for all our swimmers at Cascades who are of min. height 135cm. Swimmers will swim 50m, then go to the spinning room to cycle for 10 minutes and finally head outside cascades to run the track. Our younger swimmers from Dolphin, Sharks & new to yellow squads who are confident in swimming 1 length of the big pool take part in an Aquathlon ‘swim and run’. This is a great intro to junior tri events, more of which we hope to enjoy when we move to the new pool. We will provide further details in the coming weeks. In the meantime, feel free to speak to the coaches about the event. This year PASC are planning a club outing for all our swimmers. Swimmers aged Primary 5 and under will need to be accompanied by a parent. Also, parent accompaniment would be desirable for parents of P6 & P7 swimmers if you could please let us know. For senior swimmers we should have enough supervision. To book you place please give your name at the club desk before Wed 17th April. Cost per swimmer is £5 each. £25 for each additional non-member swimmers and parents. More detail coming soon. 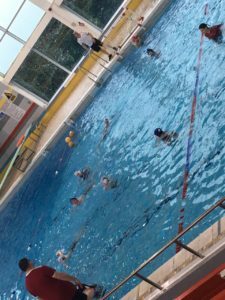 Remember if you have yet got involved in Waterpolo, just come along to training which is on every Saturday 9.00 – 10.00 am unless there is a club gala! Aquasprint 4th May and the final gala of the Forest Feast Aquasprint Gala will be HOME to Breifne. Please check your name at the club desk and the name of your parent volunteer. Warm up 4.30 pm. Girls to please bring Sandwiches and Boys traybakes. We kindly remind parents that volunteering is required to renew your child’s membership next season. Please say YES when asked to help with catering, marshalling, desk, runner or timekeeping. Best of luck to our junior swimmers 😊 The finals will be on 7th June. It’s been a few years since we had one our friendly junior galas. This gala applies to all our Aquasprint swimmers. 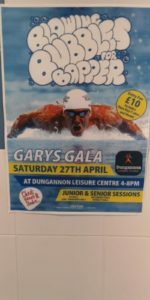 Any of our young PTL swimmers who haven’t placed podium at a swim ulster gala are also eligible to enter. Please register your interest at the club desk before this Wed 21st April please. In 2017 PASC became registered as a Community Amateur Sports Club (CASC), its CASC number with the HMRC is CH11391.